I believe that apps were created to make our daily lives efficient and enjoyable. An app should make it easy for me to “do” a task. My criteria for keeping an app or actually buying one is simple: it has to be easy to navigate and use, the content on it has to make me think, and it has to be fun for me to use. Last month, I saw a tweet from NPR about their new music app. Since I enjoy listening to many NPR podcasts, I thought I would give it a try. Rock/Pop/Folk, Jazz & Blues, Classical, World, Hip Hop/ R&B and Song of the Day. What does it take to find stories on the Canadian Soprano singing Wagner, or listen to School of Seven Bells’ song, or listen to a Raga Chamber Jazz or about women’s role in pop music culture now? Not much, except scrolling and choosing. Now I don’t have to wait for announcement-tweets telling where to look for such interviews or performances. I can just go to my phone and listen! You can add segments you like onto your playlist to keep it for awhile. I like this feature a lot as I can save them for classroom use or to develop a project idea from a story or performance. 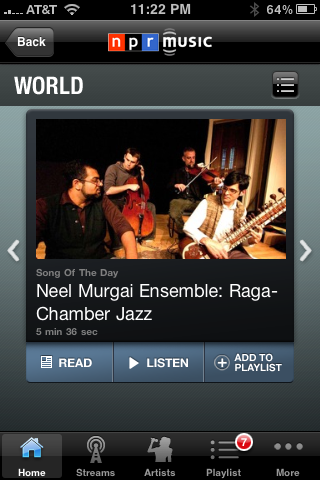 Find even more music using live music stream from 75 NPR stations or purchase featured music through your iTunes. All in all, I would recommend this app to anyone who appreciates music. 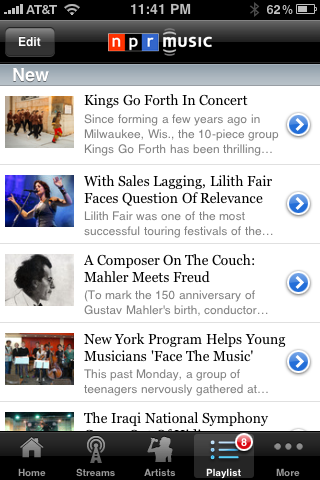 Busy music teachers, especially, can search here for interesting articles, performances/concerts, or for classroom ideas. 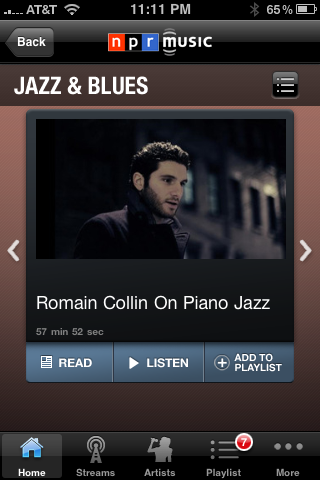 No more browsing for me: now I use this music smart music aggregator! It has become one of my favorite apps! Note: This free app is available only for iPodTouch/ iPhone. 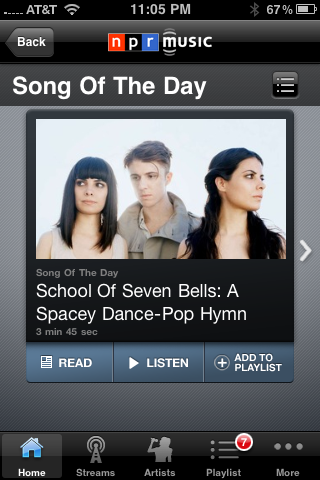 I am sure NPR is working on making this great app for other smartphones! I still love this app on my phone AND on the iPad. 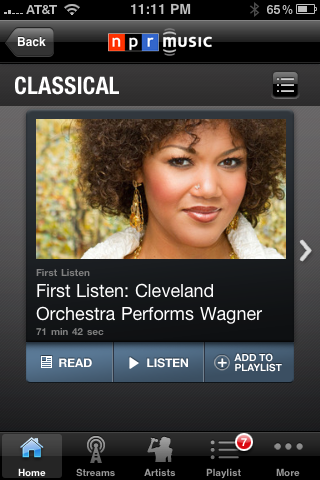 Since my first post, NPR has released the app for other mobile devices. Enjoy!